Steel Sphere Density Kit, Density Sets: Educational Innovations, Inc.
One floats and one doesn't! Which is which? Great for teaching the skills of observation and deduction! Although these two shiny, metal spheres have about the same mass, one has a diameter significantly smaller than the other, making their densities vastly different. Seeing the large one float in water seems unbelievable! Bowl not included. Read more on our Blog - Demonstrating Density: Who Knew They Could Be So Dense? Download the pdf of our newest lesson! Download the pdf of the lesson below! Which sphere floats in water? Great for teaching the skills of observation and deduction! Although these two shiny stainless steel spheres have nearly identical mass, one has a diameter of 3.49 cm, and the other a diameter of 12.7 cm. Seeing the large hollow one float in water seems unbelievable! Great for teaching that density depends on BOTH mass and volume. Ask students to observe the two spheres set on a table and predict which one is heavier and by how much. Ask one student to hold a sphere in each hand and estimate which one is heavier and by how much. The common erroneous answer is that the smaller one is much heavier. Follow this up by asking a blindfolded student to hold two small identical plastic containers, one in each hand. Place a sphere in each container and ask how the masses compare. The common answer now is that they both weigh the same. Discuss how we perceive the mass of an object. Place the large sphere in a container of water. Students are amazed to see it float. What does this tell you about its density? If both spheres weigh about 150 grams, calculate the density of stainless steel. What assumption did you make? Using the calculated density of stainless steel, calculate the thickness of the large sphere. Knowing that the large sphere has a mass of about 150 g, calculate how much additional mass could be placed inside the sphere and still float. In the last problem, if twice the calculated mass is added to the inside of the sphere, would the resulting object float or sink? Calculate the mass of the large sphere if it were solid. 6.7 g/cm3 – Base the density on the small sphere, assuming that it is solid. If placed inside, it sinks. If placed outside, it depends on the density of the additional mass, whether it is more or less dense than water. The concept of density, although seemingly simplistic, is a very difficult one to get across to the students participating in our outreach activities. It is quite easy to use the word "weight" when discussing why one item sinks and the other floats but the variable "density" comes into play because it involves both the objects mass and volume; and it is also dependent upon the medium the item is released into. I was fortunate (from reading the other reviews) that my two spheres are within a gram of each other. True, the smaller sphere appears to be "heavier" than the larger sphere. When "weighing" each they are surprised that they have the same mass. Even after weighing, they still predict the smaller one will sink and the larger will float, which when testing they find their hypothesis is true. However, their reasoning is not explained using the difference in densities, but, rather that the smaller sphere does not have air inside while the larger one does because it is hollow. It is this air that enables the larger sphere to float like a boat, which is not solid, it has cavities that hold air. And a submarine or a fish are able to dive or rise by changing the amount or air. Would it be possible to have two spheres made out of different materials but have the same volume so that one would sink and the other float? Would this help in dispelling the idea that the air inside is what determines whether it will float or sink? I don't know. The students would probably say the one floats because it is lighter than the other but you can then propose that they have the same amount of air inside. I do think the spheres are a good beginning to the develop the concept of density but to fully understand, more is needed. Their are many activities out there that attempt to do this but somehow we must get the students to construct this concept accurately for themselves. Density is a difficult concept for many people to grasp. First of all you need to understand the difference between " weight" and "mass" Then the concept of volume can further muddy the issue. This demo helps sort it all out. The spheres are clearly different in size but their mass is very close to the same. The large sphere floats and the small one clearly sinks. So the demo gives a teacher a clear visual to make the case that the density of an object is a factor of both the volume and mass if any object. The demo is great, but we are having issues with density of the small sphere. Steel should be 7.75 - 8.05 density. We keep getting 6.7 g/cm3. Would the chrome covering make that much difference? Owner Response: Good question! According to the technical specifications of the material, the smaller sphere is made of stainless steel and is not chrome plated. That said, the density is supposed to be 8 g/cm3, which is clearly not what you're getting. I will reach out to our supplier to see if they can shed some light on the subject. The density shperes serve their purpose in the explanation of density. They are supposed to weigh about 150 grams. In weighing them in our lab the students were not happy about the mass of each sphere. The smaller sphere weighs 128.6 grams and the larger 142.5 grams. The students were supprised by the difference in weights and what the product was supposed to weigh. Owner Response: Hello Andy, I'm sorry your spheres were so far apart in mass. 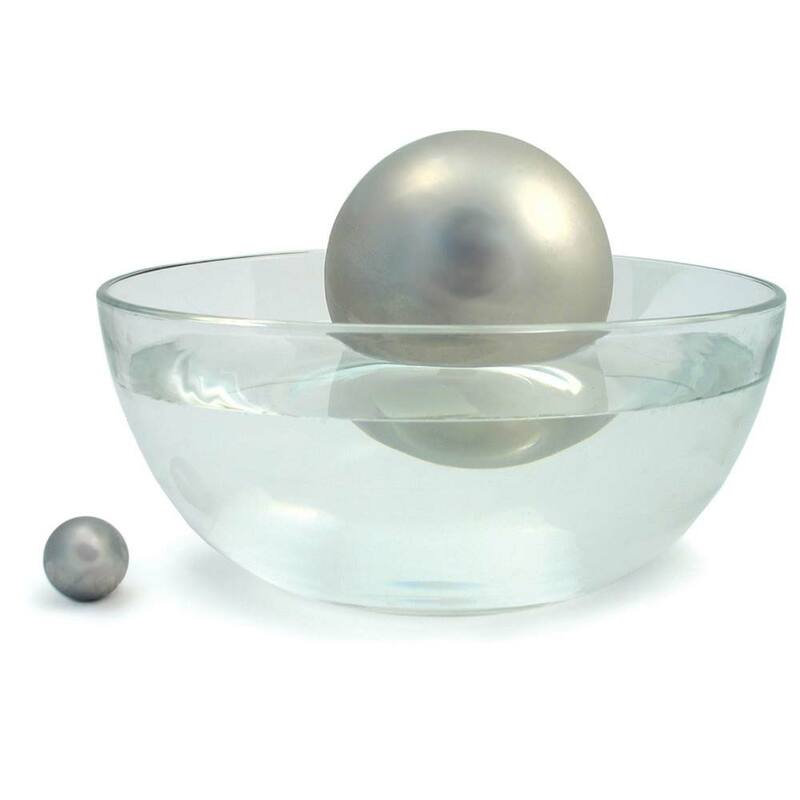 Our in-house specifications are for the two spheres to be within 10 grams with the larger one being more massive. We are happy to replace these for you. I use this as one of the stations to explore density. Students understand it is not size that provides buoyancy rather material. Great to use introducing density concepts! I love passing these around the classroom and then having students form hypothesizes about which has more mass, will they float etc. They never ceases to amaze! It's well worth the $ to add these to your classroom materials. It's a demo your students won't soon forget! These density balls are a good way to help students understand why a ship can float. The large ball is easily dented. 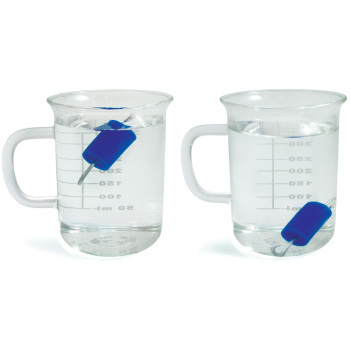 These are great for showing and working the density formula for both math and science class. I have used these 2 spheres for several labs and demos. 1) The students hold each and predict which one weighs more. 2) The students predict if there will float or sink. 3) We use them to discuss pressure, and show how the force (weight) over area determines the pressure. 4) We predict which one will roll the fastest down a ramp. Usually most students are surprised at the results! Great for correcting misconceptions! Excellent demonstration and investigation into density. The diffence in the spheres sizes provides a wonderful investigation and is thought provoking and concept builder. Get it, you won't regret it. I use these in my lesson on density. The students are amazed that the large sphere floats but yet is more massive that small sphere. Wonderful tool for teaching density. If you pretend the larger sphere is hard to pick up, the floating will fool them every time. A great kick off to density lessons. Calculations of the density of each add a level of difficulty/challenge for students. Every time I've done this experiment in a class I ask the kids to feel the two balls and decide which is "heavier". They invariably choose the larger ball and are astonished when it floats while the smaller, denser ball sinks. Then we put the balls on the scales and they are again surprised to see that there is almost no difference in mass. I really can't think of a more elegant or more fun way to introduce density! I love these to demonstrate not only density, but pressure. The students think the small sphere has more mass because of the limited area on their hands. Great teaching tool. This is probably one of the easiest methods I have found to explain density to younger students. Students can use the Steel Spheres Density Kit in an investigation to describe and classify different kinds of materials by their observable properties. Students can analyze data obtained from testing the two spheres in the Steel Spheres Density Kit to determine which materials have the properties that are best suited for an intended purpose. 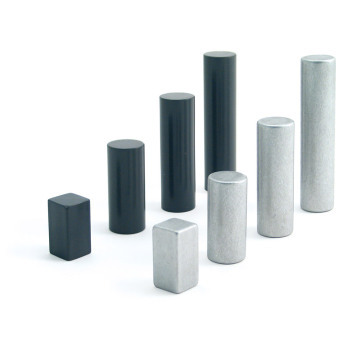 Students can use Steel Spheres Density Kit in an investigation to provide evidence of the effects of balanced and unbalanced forces on the motion of an object. Students can use the Steel Spheres Density Kit in an investigation to develop a model to describe that matter is made of particles too small to be seen. Students can make observations and measurements of the steel spheres to identify materials based on their properties. Students can use the Steel Spheres Density Kit in an investigation to develop models to describe the atomic composition of simple molecules and extended structures. Students can use the Steel Spheres Density Kit in an investigation to provide evidence that the change in an object's motion depends on the sum of the forces on the object and the mass of the object. Students can use the Steel Spheres Density Kit in an investigation to predict properties of elements. Students can use the Periodic Table as a model to predict the relative properties of elements based on the patterns of electrons in the outermost energy level of atoms. Students can use the Steel Spheres Density Kit in an investigation to communicate scientific and technical information about why the molecular-level structure is important in the functioning of designed materials. 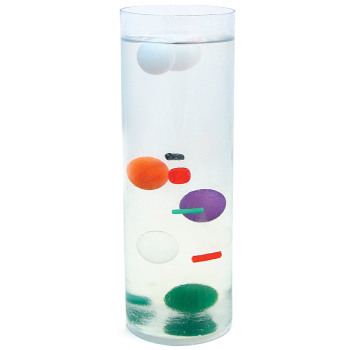 Students can use the Steel Spheres Density Kit in an investigation to make sense of density and the forces that act upon them, specifically, buoyancy. Secondary students can do the math to determine the density of each sphere. Density is a fundamental property of matter. Density is defined as mass divided by unit volume, Buoyancy is the upward force experienced by a submerged object. The size of the buoyant force on an object submerged in any liquid is the same as the weight of the displaced liquid. The principle of buoyancy is called Archimedes' Principle. 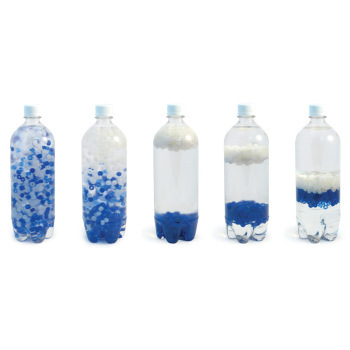 Students can use Steel Spheres Density Kit in an investigation about density and buoyancy. Although both spheres have the same mass, effects of balanced and unbalanced forces on the motion of the spheres is quite different. An outstanding inquiry activity.